Are you rocking the 24-Minute Morning Routine yet? Yes! Tell me more. No? Let me convince you to do so in three short posts. Welcome to part 2. The attraction of the 24-Minute Morning Routine is to get many high priority tasks done first thing in the morning, all at one time, and fast. Let’s call that Plan A. Yet, I’ve found an excellent Plan B: Flexibility. Because my schedule is not my own, there are mornings when I can’t do my morning routine without interruption. I’ve broken it down into three main parts that fit nicely together. The first part includes brushing your teeth and drinking water. Here’s the second part. 4. Meditate (7-10 minutes). As a morning and thinking person, I wake up with racing thoughts. Sitting down on a chair, helps me to calm my brain, collect myself, and prepare for an intentional day. While the term “meditation” can be off-putting to some, feel free to look past the term itself. The key is to stop, relax, and remember one’s best intentions for the day. I use Headspace. 5. Focus (5 minutes). As I stand up from meditation, I then set my phone timer to 5 minutes and start writing on my bathroom mirror with a dry erase marker. I sketch out my day, starting with my intention (usually a habit of disposition to practice such as patience or kindness) and then I scan the calendar in my mind (and on my phone if needed) and plot out my day. Once planned, I (attempt to) relax and let the day unfold as it will. When bedtime calls, I clean the mirror, readying it for a fresh start in morning. Part 2 comes in at approximately 15 minutes. If I need to attend to something else at this point, I do. If not, next up: exercise and stretch. 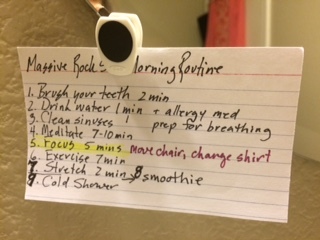 Do you have a strong morning routine? Do you need a flexible routine? Do you have a favorite app for meditation or daily planning? This entry was posted in Character, Education, Fitness, Grow, Health, Motivation, Organize, Performance, Solo, Time and Place and tagged Apps and Downloads, How-to, Morning Routine. Bookmark the permalink. My 24 minute morning routine consists of waking up and yelling at kids to get going. That leaves me almost one minute of the 24 left. Any suggestions how I should spend that “me” time? I let Ellie B aka Dogamous Pyle out back for her time. I go to the little room for one minute of me time, feed Ellie B, pour my coffee into my cup the size of my head from the pot set off to brew by timer, eat my banana for breakfast, let Ellie B back in to eat her breakfast, and immediately start working on promoting my blog on my social media sites. I continue my blog work for two hours because those are two very sharp mental hours for me, Angie McFly. Then I get into the shower for another 15 minutes of me time. 🙂 Then off to my writing work again. My puppers, Freedom, is such a patient guy who waits for me to finish up at the back of our house before I see him up front to scratch his belly 😀 I’m picturing your ginormous coffee mug and wonder if it has a motivational quote on it like, “Coffee makes all things possible!” Or maybe a funny cartoon 😀 And I’m not surprised at all to see you cracking the whip, bright and early, and hard. Bam! Oh yes, I’ll keep being me, variety and all, just with better pictures. I’ve never considered taking good photos as something of interest to me but my 16 year old son is into iPhone photographer and instagram. I think I’ll have fun trying something new and seeing myself in a different light. Thanks for the tips on what you enjoy related to blog photos.